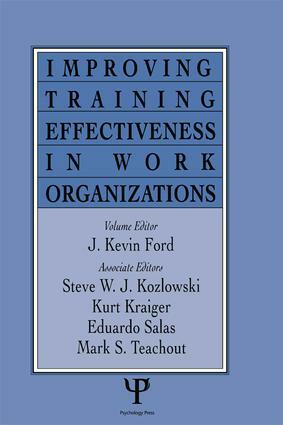 This compelling volume presents the work of innovative researchers dealing with current issues in training and training effectiveness in work organizations. Each chapter provides an integrative summary of a research area with the goal of developing a specific research agenda that will not only stimulate thinking in the training field but also direct future research. By concentrating on new ideas and critical methodological and measurement issues rather than summarizing existing literature, the volume offers definitive suggestions for advancing the effectiveness of the training field. Its chapters focus on emerging issues in training that have important implications for improving both training design and efficacy. They discuss various levels of analysis-- intra-individual, inter-individual, team, and organizational issues--and the factors relevant to achieving a better understanding of training effectiveness from these different perspectives. This type of coverage provides a theoretically driven scientist/practitioner orientation to the book. "This book addresses the concerns of practice and theory without sacrificing key elements of either perspective….we recommend this book for the Personnel Psychology reader's library. The book has much to offer the practitioner and the academician. In addition, graduate students in training seminars or thinking of conducting research on training would find this book extremely valuable." Contents: E.A. Fleishman, Foreword. Preface. J.K. Ford, Advances in Training Research and Practice: An Historical Perspective. Part I:Integrating Advances in Cognitive Science With Training Assessment, Design, and Evaluation Constructs. W. Rogers, T. Maurer, E. Salas A. Fisk, Task Analysis and Cognitive Theory: Controlled and Automatic Processing Task Analytic Methodology. M. Coovert, J.P. Craiger, Performance Modeling for Training Effectiveness. T. Goldsmith, K. Kraiger, Structural Knowledge Assessment and Training Evaluation. Part II:Viewing Learning as a Continuous Process: Implications for Training, Socialization, and Employee Development. T. Baldwin, R.J. Magjuka, Organizational Context and Training Effectiveness. G.T. Chao, Unstructured Training and Development: The Role of Organizational Socialization. R.A. Noe, S.L. Wilk, E.J. Mullen, J.E. Wanek, Employee Development: Construct Validation Issues. Part III:Understanding How Context Affects Training Evaluation and Transfer. J.E. Mathieu, J.W. Martineau, Individual and Situational Influences in Training Motivation. G.M. Alliger, S. Katzman, Reconsidering Training Evaluation: Heterogeneity of Variance as a Training Effect. S.W.J. Kozlowski, E. Salas, An Organizational Systems Approach for the Implementation and Transfer of Training. Part IV:Applied Psychology and Training: Methods for Improving the Linkage Between Training Research and Practice. E. Salas, J.A. Cannon-Bowers, E.L. Blickensderfer, Enhancing Reciprocity Between Training Theory and Training Practice: Principles, Guidelines, and Specifications. K.J. Klein, R.S. Ralls, An Exploration of the Unintended Organizational Consequences of Technology Training: Implications of Practice for Training Theory and Research. Part V:Final Observations. E. Salas, J.A. Cannon-Bowers, S.W.J. Kozlowski, The Science and Practice of Training--Current Trends and Emerging Themes. Bridging both academic and applied interests, the Applied Psychology Series offers publications that emphasize state-of-the-art research and its application to important issues of human behavior in a variety of societal settings. To date, more than 50 books in various fields of applied psychology have been published in this series. To propose a title, please contact Jeanette Cleveland (jeanette.cleveland@colostate.edu), Kevin Murphy (krm10@me.com), and Christina Chronister (christina.chronister@taylorandfrancis.com).